I understand completely that many times I need some pressure and deadline to get things done. What kind of things? Simple things like this, writing something! I like writing, I have so many ideas in my brain, but I rarely put my ideas into words. You may call me a lazy sloth. I am. But, it's a different story when I have a deadline. It gives me pressure and I am an I-have-to-finish-my-work-before-deadline type of person. That gives me such motivation to finish what I try to do. 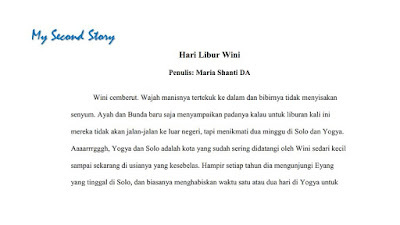 Recently, I said yes to be a volunteer in writing a short story for children. It should be an inspiring children story. Oh My God, after I said yes, I was in regret. Because I didn’t have any idea to write. Well, to be honest, finally, the deadline saved me. Thinking that I had made a promise to other person gave me an urge feeling to be more creative. It gave me a little push to start writing something. And I did. I finished the story in two days. Wooohoooo.. That’s really a record. From absolutely have no ideas to okay I have an idea then to finally put the ideas into a story. All in all, what I have done lately gives me confident to create more stories and to write more. To write about anything. I just need a little push. Who wants to give me deadline???? ?